Suspension training is a popular new way to exercise and gain strength. 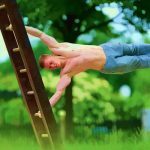 Using your own body weight and with the help of gravity, it provides full body movements that target all major muscle groups at the same time. 8 What is Suspension Training? 9 What type of exercises can you do on a suspension trainer as a beginner? 10 What are the advantages of Suspension Training? The handle grip is made up of hard rubber instead of soft foam. Adjusting the length is very easy – pinch cam buckle and pull strap to desired length. You get all the features of TRX at a reduced price. It comes with all the attachments including a foot loop, door anchor strap and a carabiner. You can attach it to a hook on the wall or hang it from a ceiling, a tree or door. No tools are required to attach it to the door as the thick cylindrical acrylic anchor strap prevents it from sliding through the shut door. As a precaution it is advised not to attach it to a door which opens towards you. It’s even safer if you bolt the door when using any suspension trainer. The center suspension strap with two cam buckles is around 7 feet and the anchor strap is around 3 feet long. Suitable for beginners, intermediate or advanced training levels. A drawstring bag is included in the package for easy storage. When attaching it to a pull up bar make sure the bar can support your weight and is secured properly. Attaching it to portable pull-up bars is not recommended. The suspension strap webbing is around 1.5 inch wide. 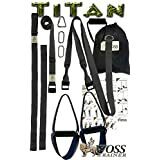 The WOSS Attack and Titan trainers have a weight capacity of more than 300 lbs. It does not come with a ceiling or wall anchor or a rafter. Package includes a quick start exercise sheet showing 18 exercises. Not recommended for See-Saw exercises. Gymstuff G-Strap comes with two dense foam handle grips and an extension link for wrapping objects. 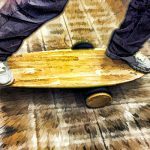 The straps have a stability wheel for both one and two handed workouts. The G-strap width is 1.5 inches and comes with foot loops on both sides. 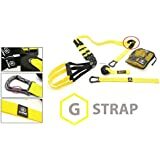 The adjustable G-Straps are rated for a weight capacity of about 650 pounds and their pro version is rated up to 1300 pounds. Package includes a drawstring portable bag. Door wheel mount included for anchoring it to your door and helps prevent scratches. Military grade lockable metal carabiner and cam buckles. The carabiner is lockable for extra safety and an Allen wrench is included in the package. The total length of the G-strap with extension link is around 8.6 feet. The Pro version has a rubber grip, a longer extension link and different stitching pattern. It is more compact than the WOSS Attack trainer and also has more anchor straps. The two foam handles are not fixed to a central anchor point like in the Military Strap Trainer. You need to balance the two sides while working out. The 1-inch single strap system pivots on a D-ring. The strap length is adjustable using the sliding adjustment buckle and the spring cam buckle. 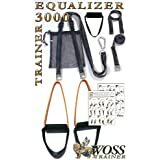 The 3000 Equalizer comes with more anchor choices – padded door anchor, a 2ft long double loop anchor strap and 8ft long Anywhere Anchor Strap with built-in door anchor for attaching to high structures. 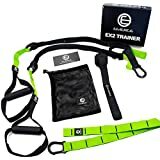 The package includes a carabiner, a nylon drawstring bag, an exercise poster and an instruction sheet to setup your trainer. It is not recommended to use this trainer for see-saw exercises. Apart from the TRX central suspension strap, it comes with a yellow TRX suspension anchor and a TRX door anchor. Ceiling mount is not included with this kit. Included in the package is a 35 page exercise guide, a DVD showing beginner workouts and a TRX mesh carry bag for easy storage. The weight limit for the TRX suspension trainer is 350 pounds. The carabiner has a rating of 1300lbs. The 5 inch long fixed handles are made of a plastic core enclosed with dense foam padding. The 1.5in wide straps are made out of industrial grade nylon webbing. The strap length is adjustable from 6 to 12 feet using non slip cam buckles. Foot cradles have neoprene padding for added comfort. The equalizer loop helps in leveling the handles. The TRX trainer has a built-in locking loop as a safety feature to prevent falling in case the user loses grip on one of the handles. 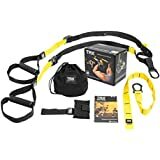 Total Resistance eXercise or TRX was the first to come out with suspension training equipment and the concept of portable home gym. However their suspension trainers are quite expensive as they are really well built and last longer. 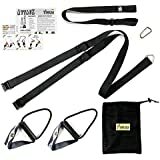 Other brands have also come up with similar concepts of suspension training at a far lower price range and WOSS is one of them. WOSS suspension trainers are priced lower but they have not compromised on build quality. WOSS suspension trainers use a nice thick rubber handles which feels better. The cord connecting the handles is flexible and easier to work with unlike TRX which is a little rough to your wrists. The adjustable buckles are about the same. TRX uses a synthetic type loop for the suspension trainer to move around in while WOSS uses a thick steel loop. This is a better design since it prevents shaving of material after heavy usage. WOSS also includes a lot of attachments with their units for no extra charge. There are a couple of differences between the WOSS Attack and WOSS 3000 Equalizer models. The grip handles in the WOSS 3000 are foam rubber handles which are pretty comfortable but tough to clean. The handles in the Attack model are a little shorter and they are rubberized which are much easier to clean. Besides that the cord that holds the handles in place is a little thicker in the WOSS Attack model. Also the strap in the Attack version is one and a half inch wide versus the 3000 Equalizer model where it is only one inch wide. The design of the D-ring is different for these two models. Suspension Training refers to any type of suspension trainer that you hang up from a bar or a high point that allows you to do modified bodyweight exercises. Some people may have difficulty doing push-ups or pull-ups or may have trouble with squats. So a suspension trainer allows you to use different portions of your bodyweight to make those exercises easier and more effective. This allows you to gradually increase the amount of weight you are using as opposed to all or nothing. There are lots of brands of suspension trainers and obviously TRX is one of the big ones. Once you have bought a suspension trainer the only other thing you are going to need is some kind of a bar or a beam where you can mount it. You can even throw a lot of suspension trainers over a doorway and close the door to make sure that you can use it in your home on your own. 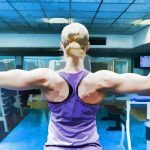 What type of exercises can you do on a suspension trainer as a beginner? There are three basic exercises that you can do on a suspension trainer to start with – Squats, Push-ups and Pull-ups. 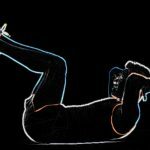 Squats – If you have problems with range of motion or mobility in your knees, hips, ankles or lower back, etc., the suspension trainer is a great way to learn proper squat technique without sacrificing any kind of form. 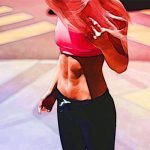 You use your upper body to ease some of your body weight off your lower body making it a little more low impact and a little less strenuous on joints and muscles. Pull-ups – Most of us manage just a handful of pull-ups at a time and are not able to reap most of its benefits. 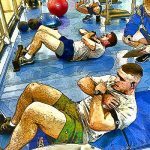 However by doing a bodyweight row on a suspension trainer with your face facing upwards, you can get the same benefits and strength gains while gradually increasing your workload by using more and more of your bodyweight on a suspension trainer. Push-ups – A suspension trainer is a great way to incorporate push-ups in your workout routine. 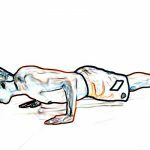 The push-up is the exact reverse of the bodyweight row while doing pull-ups with your face facing the ground. What are the advantages of Suspension Training? Suspension trainers can be used by young trainees for strength training and full body workout, who may not be ready for more complex lifts. Every exercise that you do with suspension trainers helps you to engage your midsection. 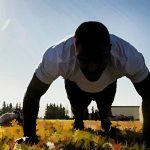 Whether you are working your legs, your back or your chest, core stabilization is required for every exercise. It targets your abdominals and obliques in your lower back. Using suspension trainers as a way of resistance training will help achieve muscular endurance, build muscle strength and burn excess fat. Exercising with suspension trainers at home or outdoors is a great alternative to exercising with electronic fitness equipment, free weights or purchasing a gym membership. Suspension training offers multiple workout options for a total body workout which includes exercises for your arms, abs, thighs, glutes, biceps, triceps, quads, chest, legs, back, shoulders and your core muscles. Suspension trainers offer a more effective way to stretch by providing a greater range of motion for the user. This free motion stretching can improve the user’s flexibility over time. Unlike machines or weights, suspension weights are easy to store and carry. You can carry suspension trainers when travelling for vacation or business. They weigh less than two pounds and you can hook them on to a tree, on the side of an SUV or on a door anchor inside your hotel room. They help you to stay fit anywhere you go.